*Must leave River Forest by 7:00am **Depends upon river height. 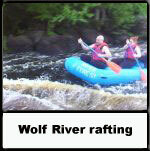 Everyone rafting MUST print and fill out a WAIVER FORM. This needs to be brought in the day you go rafting. If you are a young adult/minor and you will be rafting without your parents/guardian, the waiver must be signed by your parents/guardian and brought with you to the trip. Another adult can not sign for your legal guardian. Call for group pricing for groups of 20 or more. *Drugs and alcohol are NOT allowed on the raft trip! Wet suits available for rent!